Whether you are looking for a beautiful residential neighbourhood or a close-knit community filled with energetic individuals, Lynden Hills is the place for you. 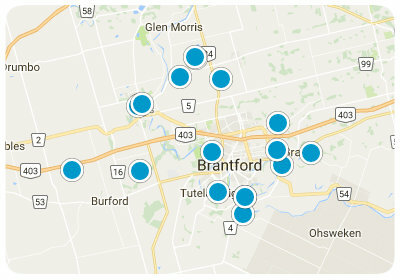 Located on the northeast end of the city of Brantford, the beauty and sheer charm of the Canadian countryside will captivate you upon looking at it. The lush green trees and bushes lining each residential street is a refreshing sight to see after the snow in the winter months has melted away. Located within close proximity to numerous parks, gather your friends, neighbours, and family to play a game of soccer or football, let the kids play in the Splash Pad at Bridle Path Park, go for a hay ride or pick strawberries at Brantwood Farms, or enjoy watching the sun set over the endless foliage of the countryside. Lynden Park Mall offers the convenience of shopping and dining, including a grocery store, department store, and other services such as a salon and spa, and numerous restaurants. Buy a home in Lynden Hills and enjoy being a short drive away from all sorts of accommodations abound. Take a trip to the Grand River, and have a blast fishing, rafting, or kayaking along smooth stretches of emerald water. Fall in love with the small-town feel of Brantford and the breathtaking abundance of natural beauty that encapsulates the city. Play a game of baseball with friends at the Jaycee Sports Park, or take a misty morning jog on the Wayne Gretzky Parkway trail. There is always something to do in this wonderful community. With an approximate population of 3,500 residents Lynden Hills is a tight-knit community where residents know each other by name and children walk to school in safety. With a varied range of real estate options that are available in Lynden Hills, from single-family homes to condominiums, every budget can be accommodated. Located at the edge of the picturesque countryside, homes in Lynden Hills have a gorgeous view that will leave you speechless time and time again. If you would like more information regarding homes for sale in Lynden Hills, please allow us to assist you and contact us today.